Despite being without four regulars, including the pre kick off loss of Peter Collins, United fought hard and got everything they deserved as 4th placed Bath City were well beaten at Church Road this afternoon. A fast paced opening to the game saw chances come thick and fast for both sides. 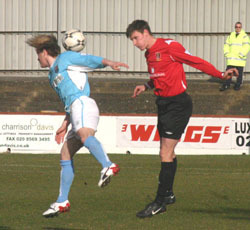 Kieran Knight set up a chance for James Mulley who saw his attempted volley deflected over before a Liam Collins shot was blocked by his own man in the form of Staforde Palmer who flicked the ball up and tried one of his familiar overhead efforts that beat keeper Paul Evans only to bounce off the top of the crossbar. City's Scott Partridge then found Justyn McKay lurking on the edge of the United area but he fired wide without troubling Preddie. As play switched from end to end, Palmer again hit the Bath crossbar, after latching onto a poor Sekani Simpson clearance, but Evans caught the ball as it came back into play. Almost instantly at the other end, Simpson and Luke Prince combined on the right with the latter finding Lewis Hogg in the middle but his volley was just too high to trouble Preddie. As the half reached its midpoint, United continued to press for the opener. Palmer found Knight in the area, he held off his marker before hitting a shot that Evans spilled with Simpson clearing away the loose ball from his own goalline. Just minutes later, a foul on the edge of the area brought a free-kick for United. Charlie Mapes rolled the ball to his left to set up Scott who fired low past the wall and just inside Evans dive at the foot of the post to give United a deserved lead. 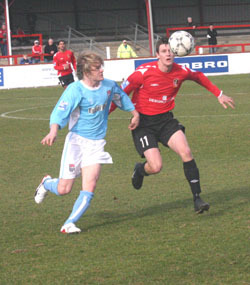 Within a minute the visitors could have twice hit United, a long punt bounced over Adam Thompson to Dave Gilroy but he bounced a weak shot into the ground that Preddie gathered and seconds later a misplaced pass let in Scott Partridge but he was denied a shot by an excellent Thompson tackle as he prepared to fire at the United goal. Liam Collins did well to chest down a Mulley cross that had been missed by Simpson but his effort was easily held by Evans and Collins then almost turned provider but Mapes' effort was just too high. Then with just three minutes to the break United were awarded a spot kick when Palmer turned his marker in the area and was dragged to the ground (right). Scott stepped up and despite Evans guessing correctly, the kick was too pacey and United had doubled their advantage (below). With so much action in the first period it was no surprise that the pace lessened in the second. In fact it took almost fifteen minutes before pen hit notebook as United went on a sweeping surge upfield led by Scott on the right flank, his neat pass found Knight who entered the box and showed his unselfish side by trying to pick out either Palmer or Ram Marwa in the middle, sadly his cross was cut out by Simpson who cleared for City. In the 69th minute having made a sharp save at the foot of his post Preddie launched the ball long and as Jim Rollo and Chris Holland stood and watched it bounce Palmer nipped in to calmly slot past Evans who must have been aghast at his centre backs who gave him no protection at all. Preddie was called on for the only real time on 77 minutes when City substitute Darren Edwards found himself baring down on the keeper only for the United man to raise a last minute hand to push the ball wide of the upright and help United to a first clean sheet of 2008. 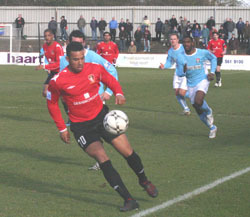 In the dying embers Scott had a great chance to nail his hat-trick after being sent through by Joel Ledgister but despite beating Evans he also beat the far post by a matter of inches. Scott (29, 42 pen), Palmer (69).